If you’re an active person, you put an enormous amount of strain on your body, from your muscles to your joints, and everywhere in between. Physical therapy is designed to strengthen your musculoskeletal system naturally and is ideal for injury rehabilitation, strengthening and conditioning, and preventive care. 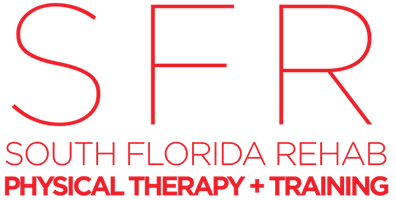 At South Florida Rehab and Training Center (SFR), the physical therapists help their patients deal with practically every biomechanical issue there is and can certainly help you with yours. Call or book an appointment online to see how physical therapy can help you. Injury or chronic pain: Physical therapy works with you to rehabilitate injuries and mitigate chronic pain, especially in the following areas: back, hips, knee, neck or shoulders, feet and ankles. Postoperative: When surgery is unavoidable, physical therapy plays a critical role in your recovery and rehabilitation. Through physical therapy, you can retrain your body, strengthen the injured area, and regain mobility. Preventive: As a preventive tool, physical therapy can’t be beaten. The therapists at South Florida Rehab and Training Center understand the biomechanical system through and through and tailor a plan that leaves you stronger and more flexible than ever. What can I expect during a physical therapy session? To learn more about the many benefits of physical therapy, call South Florida Rehab and Training Center or book an appointment online.